These delicious tartlets make a perfect weekend brunch when friends come ‘round. Just a few minutes prep work and not much longer to bake in your convection oven, and you can serve out an impressive gourmet treat! Cut out 12 × 7 cm (approx) circles of pastry to fit into the base of 1 greased 12 holed tartlet tin. Preheat the oven at 200 °C with enamel shelf in lower position. Mix the red pesto, tomatoes, mozzarella and garlic in a bowl. Fill the tartlet shells with mixture. Bake tartlets on 200 °C for 14 to 16 minutes or until golden brown. 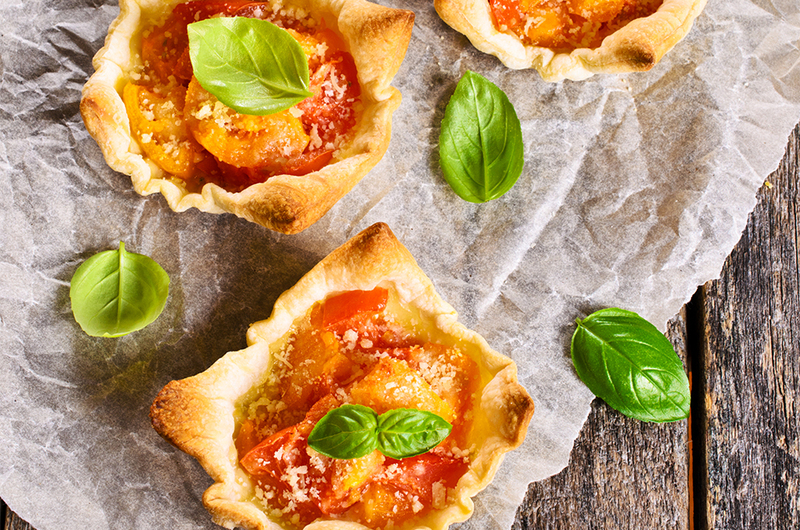 Scatter fresh basil leaves on tartlets to serve.